LG Electronics has seen a big jump in second quarter profit, due to a turnaround in its mobile phone unit. Net profit amounted to 412bn Korean won ($400m; ￡235m). That's a 165% surge when compared to the same period last year, when it earned 156bn won. The jump is mainly due strong mobile phone sales. LG sold a record 14.5 million smartphones in the second quarter, 20% more from one year ago. LG's mobile phone unit is profitable for the first time in a year. For the current quarter, LG says it expects "the smartphone market to grow continuously." But the company also warned "market competition will be intensified due to continuous launch of new models in premium segment and intensifying price competition as a result of the sales expansion from the mass market." 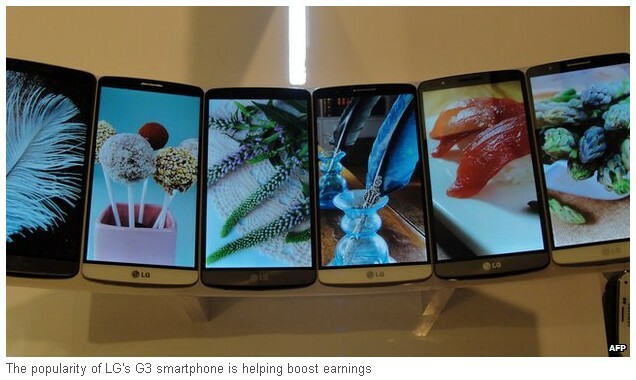 Various industry research places LG as the world's fifth-largest smartphone maker by sales. Its South Korean peer Samsung has overtaken Apple as the world's top smartphone maker. Both Apple and Samsung phone models are more geared towards capturing consumers at the high-end market. LG has been expanding its line-up of cheaper phones, as well as its high-end models, in order to capture a diverse market share. Away from the smartphone division, LG's home entertainment unit saw a 3% rise in sales when compared to the previous quarter. That is due to the launch of new television models. The home appliance division saw an increase in sales at home, due to higher demand for energy-efficient washing machines. But overseas sales declined, due to competition in the North American market.